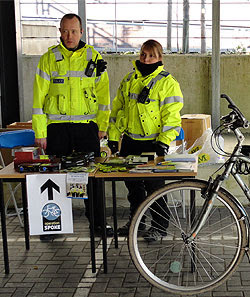 Operation Spoke is York's bike registration scheme. Local police have their eye on several dodgy lockup-garage dealers in the area - the sort of people who advertise lots of bikes of hazy provenance on Gumtree or eBay. But it's hard to prove a bike has been nicked - which is where this database comes in. We stumbled across a Spoke Registration Event on Sunday (top right), ambling round a deserted York College. No elaborate bike surgery involving transponders inserted into down tubes here. 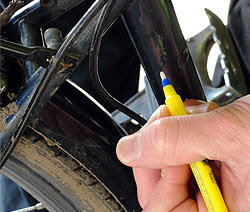 All that happens is a bloke writes a code number in various places on your bike with a special pen (right). The writing only shows up under UV light, if you take your bike into a disco for instance, or a public toilet in Hull. Well, he said it was a code number he was writing. It could have been Ha Ha Big Nose. Probably best to be nice to registration teams, just in case. 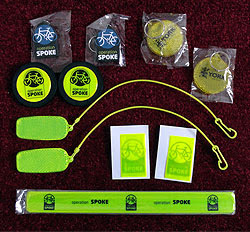 There's a national self-registration scheme at immobilise.com, but Spoke sessions are worth dropping in on, partly for peace of mind, but also because you get lots of free yellow things (right): keyrings, spoke reflectors, trouser bands. What are those things in the middle of that photo? I was wondering if they could be spoke reflectors that stay on (disc ones don't, I've found) but I'm not sure.